DEAR PAPERLICIOUS: Just Because . . .
No, I haven't returned from a trip, just using stamp sets that are my style. When it comes to stamping, I've learned that I'm not good with most trends. Just give me some beautiful flowers and I'm happy. So I checked out Flourishes recently and scooped up a few sets, including the new Anemones set. Here's my first effort with that set paired with Inside Out Just Because (a sentiment set). The inside says "you needed a little cheering up." I know the perfect person for this card. I found some pretty A Muse Studio cardstock in my left over stash and stamped it with Hero Arts Unicorn (white) ink. Added a few black dots in the centers and a spray of silver thread from my Mom's sewing stash. Thread adhered with a mini staple. 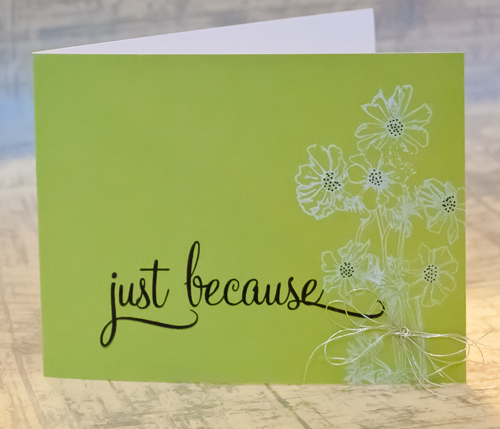 The A Muse card stock is perfect for your gorgeous card! Awesome use of the silver thread too! Beautiful, Joan! I just picked up that white ink pad after using the SU! one for a decade. So so beautiful! How did I miss this post? Absolutely gorgeous! Love that green!